You nod your head “yes” and wave your bangled arms in the air. This is EDM, you decide. 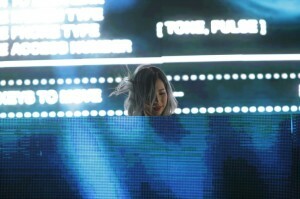 And that blue-haired DJ on the stage knows what she’s doing, you realize. She’s blurring the lines between genres. She’s breaking the rules. She’s pioneering a new sound. Since the mid-aughts, Tokimonsta has been challenging EDM fans to think outside the confines of traditional electronic dance music. She’s made a name for herself by melding rap and hip-hop beats into her music and crafting complex, unique tracks that have enabled her to reach a slew of listeners from different musical genres. Her appeal is widespread — both hip-hop heads and EDM devotees can find something to like in her music — and, more often than not, her beats are unlike anyone else’s at the festivals she plays.